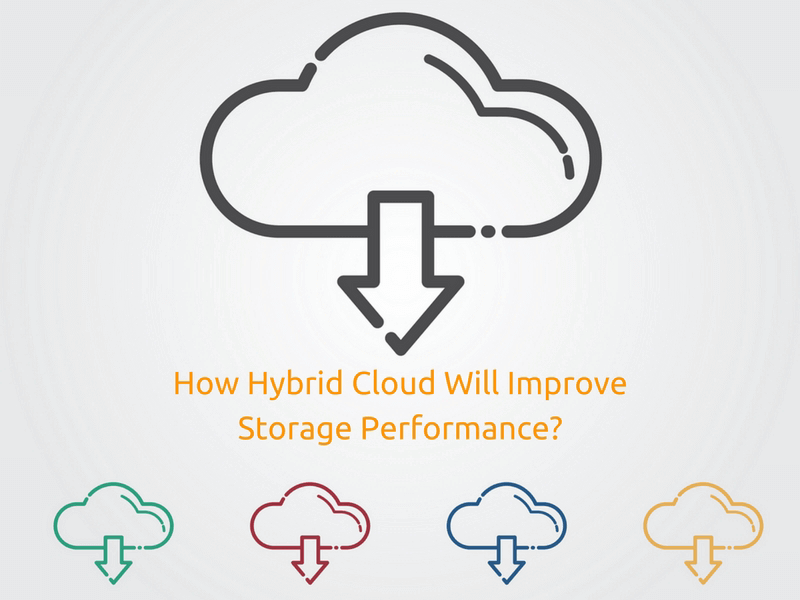 How Hybrid Cloud Will Improve Storage Performance? As of today, one of the best parts about the internet is the accessibility to the cloud. The cloud is one platform where you can store all your data without fearing breaches. As a matter of fact, there are three different kinds of cloud computing solutions. One, a public cloud – which can be used in cases where there is extremely heavy traffic. Two, you have the private public which comes with extra security and protection. Finally, you have the hybrid cloud which basically combines the best of both the worlds. It is a fine blend of the private and public cloud infrastructures. You see an environment that is solely public or private cloud comes with its own set of limitations. The hybrid cloud, as the very name suggests, combines the best advantages of both kinds of environments and presents to you a fine package. When it comes to data centers, a huge chunk of the data, nearly 90% is not accessed and wasted. This data is left unprotected, duplicated, replicated, snapped and it keeps accumulating. Can you imagine how much space that’s taking up? This is known as passive data which simply consumes storage that is expensive. Now the idea solution would be to transfer all this passive data to a public cloud that is much cheaper. However, the process isn’t quite so simple and it is rather inconvenient as well. Yet with advancement in science and technology, it has become possible to transfer the passive data to lower storage options automatically without you having to invest too many resources into it. If you were to migrate your data this way, it would certainly save a lot of space which could be used for something much more important. One of the major uses of cloud is for backup. Whatever data you have would be lost without backup. You would have to backup your data at regular intervals to ensure that there aren’t any glitches. However, backup takes up a lot f precious space too. When you’re backing up your data after a long time, there’s a lot of it that needs to be covered. Similarly, if the amount of data being backed up is huge, it could lead to issues. These issues could create problems as far as performance is concerned. In the case of hybrid clouds, the data that is backed up recently would be stored locally and would be able to work on the local performance. That way, you get to enhance the performance of your cloud and make sure that it works to its fullest capacity. When you are working with cloud, it can be difficult to predict how much load you might have to handle. If there is a sudden surge in the load, it might be difficult to make up for it with whatever resources you may have since that may not be enough. This is one of the major advantages of using hybrid cloud. This environment would be able to make provisions for such a sudden spike without having to switch to cloud bursting. Since migrating data from one platform to another becomes all the simpler, it would be convenient to simply transfer the data to a public environment which would be able to handle the load efficiently. That doesn’t put excess pressure on your resources either. Both private and public cloud systems have proven their worth over the years. Each type of cloud is suitable for a certain workload and can work efficiently within their boundaries. But what happens when the boundaries are crossed? Data, as you must understand, is unpredictable. You can never predict the workload; consequently, to restrict yourself within boundaries would be a wrong move on your part. Instead, it is better you go for something that is far more flexible and versatile. The hybrid cloud system would be able to switch from a private to public environment and vice versa, depending on the data and the amount of it that has to be processed. It is a kind of holistic approach to data processing and provides a one stop solution to everything. These are just four basic, and not to mention key advantages of using a hybrid cloud system. The best of both worlds – that is exactly what you get when you use such an environment for accessing and processing your data.